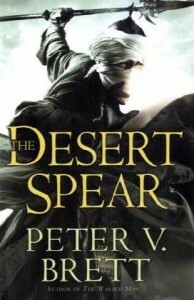 Peter V Brett continued his story of the Demon Cycle in The Desert Spear eloquently describing his world and bringing more depth to his characters. I loved the book and can't wait to start The Daylight War. The religious aspects of the story were well established making the reader easily bring comparisons to current religion cultures. I wanted to hate Jardir for his holy war against the Northlanders but in the end rooted him on as the author showed a more cunning side to the corelings and the true nature of the desert people.